IFP Will Help Selected Producers (IFP Members Only) Get to Cannes! IFP, through its partnership with Festival du Cannes Producers Network, will select five American independent producers to participate in the 2010 Cannes Producers Network Fellowship program. The Fellowship will cover the cost of full program registration fees for the selected producers. Launched in 2004, the Producers Network is a week-long program which runs concurrently with the Festival du Cannes. Conceived to boost international co-productions, the Producers Network welcomes a select group of 550 producers from all over the world, offering many formal and informal networking opportunities to assist producers in finding partners for their projects and expanding their international contacts . Applicants should have at least one fiction feature-film producing credit and be a current IFP member. Those interested in consideration for the program should apply with a one-page letter of interest describing the project(s) that would be presented at the Producer’s Network and a resume to Amy Dotson, Deputy Director, IFP, at adotson@ifp.org by Wednesday, March 10th. This morning, in our partner Shooting People.org's daily newsletter, a member's post caught my eye. "Our film, called "Promised Land of Heavy Metal" is an HD documentary app available now for the iPhone and iPod Touch. The feature film investigates the history and philosophy of Finland's prominent, and world reknowned, Heavy Metal music scene. This is the first indie-film App released in the world." I am not one who can vouch for the validity of that statement (Lance Weiler? Scott Kirsner? anyone care to weigh in? ), however it's still interesting. As the filmmakers who posted noted: "With over 50 Million iPhone and iPod Touch users in the world, and over 7 Million Applications downloaded each day, the App Store is sure to become an important distribution/promotion medium for video and music content producers around the world. The app store eliminates many of the distribution barriers facing independent filmmakers and makes it easy to get their films into regions outside the country of origin. This new way of distribution doesn't "compete" with the traditional TV or DVD distribution, but helps to advertise and spread the message about the film." It will be interesting to see how successful this is. As an added bonus, the filmmakers off to help others create their own Film Apps. You can check out the App here. Immediately after our sold‐out press screening we received a number of festival invitations from all over world. We were on top of it. But the next morning we received our first review, a pan from Peter Brunette in The Hollywood Reporter. It stung, but we tried to shake it off, as it seemed almost personal his disdain for the film was so strong. There is something that occurs in the face of public criticism, or praise, a kind of personal realignment that takes place when you’re showing your work to audiences and critics on this scale. I’m sure it’s different for everyone, but in order to manage I feel myself turning into something more monstrous every day. In the morning, a man I’ve never met calls me “inept” and “pretentious” in print, thousands read it,and that evening I have to share my film for the very first time with an audience and talk about it after. In order to get through this day, I find myself devouring everything around me, which leaves me isolated and afraid. Seeing the film with an audience for the first time conjures a mix of emotions. I fear my anxious energy will exit my body and enter the atmosphere of the room, somehow changing the experience for others; I sense the audience and know when they’re with my movie and when they’re not; I see lots of little things I want to change. I wonder if my movie’s really bad and THR was right. Thankfully, our screenings only got better as the week went on. I didn’t attend the second, but the Q&A afterward was wonderful. I sat with Marc Vives, my editor, through our Saturday night screening at the Delphi, a beautiful old moviehouse in which Putty Hill felt right at home. 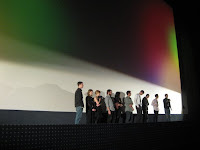 The projection was perfect and Mark Perenson of Cinemascope moderated an excellent Q&A. The German and Austrian press loved PUTTY HILL and over the course of the week, we received lots of enthusiastic feedback in support of the project. As for parties, we threw one for PUTTY HILL at Ausland, and it blew up. Jason Forrest, Christoph Linder, and Sick Girls played tons of Baltimore Club. I jumped up for a quick set. Lots of our friends attended, new and old, plus press and Forum staff, EFM folk, and programmers and distributers from around the world. Throughout the week, there were interviews and meetings. There was also a city to explore. It was hard to catch films, but I saw a few. My favorites were Sharon Lockhart’s DOUBLE TIDE, LA BELLE VISITE by Jean‐François Caissy, and from the reparatory, Glauber Rocha’s ANTONIO DAS MUERTES. I walked out of THE KILLER INSIDE ME as Jessica Alba was getting beaten to a pulp. by paying off our debts, and begin saving money for a 35mm print. As Filmmaker Magazine reports , B-Side Entertainment the distribution and technology company based in Austin, Texas, announced that, due to lack of financing (venture capital fund Valhalla Partners pulled out in late 2009), will close its doors. 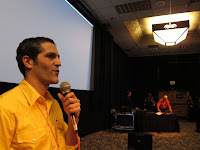 Launched in 2005 by Chris Hyams, the company has laid off the majority of its staff already, and is currently looking for a home for the films it distributes, as well as the festival scheduling service, Festival Genius, that was used by IFP to schedule the Independent Filmmaker Conference. For more details on the story, see Scott Macaulay's post at the Filmmaker Magazine blog. I arrived in Berlin on Saturday with my producer Joyce Kim, after a long flight and an even longer layover. The snowdrifts in Baltimore were over 8 feet high, so the ice‐packed streets of Potsdamer Platz presented no challenge at all. We decided to plow through the day, working on 48 and 72 hours, respectively (though Joyce took a quick nap in the closet when we checked into our hotel). crowd. Of course, we were both overwhelmed: the scale of everything here is huge and the professionalism is unparalleled, yet everyone at the Forum had watched our film and had something pointed and thoughtful to say in support of it. We felt honored and appreciated instantly. It was obvious that this was a festival that loved film. Jordan Mintzer, producer and co‐writer, arrived from Paris the next day and gave us a tour of the European Film Market. This, too, was a major culture shock – working in Baltimore in relative obscurity, one forgets that the cinema is a commodity; but at a market, where companies sell films like vegetables, you realize how small and blemished you are. We haven’t screened yet, though our team has now assembled: Joyce, Steve, Jordan, Eric Bannat (producer), Jeremy Saulnier (DP), Marc Vives (editor), Devon Deimler (script), Sophie Toporkoff (production design), and me, director. Our press screening is tomorrow, we throw a party Wednesday, and our premiere is on Thursday; then we screen four times before the festival ends. The theatres are so big: 400, 600, 700 capacity! I can’t imagine how we’ll fill them. And, if we do, where my heart will be afterwards. What else? Beer. Schnitzel. Kabob. Coffee. We thrive on free meals and screenings, and nap when we can. Coincidentally, I talked to Amos Poe this morning and then watched him in a film tonight (BLANK CITY). Nick Zedd was in it, too. And John Waters. What does this mean? We’re all connected, those of us who work outside the system. And the strong ones survive, despite the incredible odds. That’s what the Forum’s all about,supporting new visions and new talent, and establishing a venue where even little films and independent filmmakers have access to the world’s stage. Filmmaker Kim Reed, whose remarkable documentary PRODIGAL SONS is an alumnus of Independent Film Week's Spotlight on Documentaries program, will be featured on the world's most famous talk show this Thursday. Congrats to Kim and her whole team; we are sure she'll be fantastic. 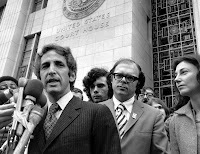 The Most Dangerous Man in America: Daniel Ellsberg and the Pentagon Papers is among the 5 nominees for Documentary Feature. Directors Judith Ehrlich and Rick Goldsmith brought the film to Spotlight on Documentaries in 2007. It is currently being distributed by First Run Features; it screens in New York City at Cinema Village, and elsewhere around the country. Roger Ross Williams' Music By Prudence is a Documentary Short nominee. It is being distributed by HBO Documentary Films, who met with Williams when the film was at Independent Film Week in 2008. HBO2 will broadcast it May 12. 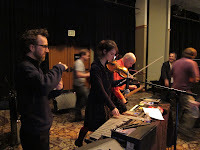 Music By Prudence also participates in IFP's Fiscal Sponsorship program. Other documentary nominees include friends of IFP like Lab mentor Julia Reichert's film The Last Truck. Congratulations to all the nominees! We wish you all the best - we're voting for you in our Oscar pools! I’m in this snowy winter wonderland as a producer on Utopia in Four Movements a ‘live film’ by Sam Green and Dave Cerf. This ‘live film’ thing is unusual, but it sounds pretty simple – images on screen, a director narrating with a mic, someone DJ’ing the soundtrack from his laptop, and a few musicians playing along. However, it turns out that there’s some technical stuff that has to happen for this to work out. And most festivals are more used to projecting a film (or tape) without live accompaniment so this is a bit of a challenge – but that’s why we’re in the “New Frontiers” section, and they’re really accommodating about our requests. But first I’ll tell you a bit about the past couple of days in Utah. Anyway, by the time of today’s show, we were all quite nervous. This is live! Sam is going to stand there in front of the audience, without a script, and with a little remote control to click through still images and Quicktime movies. And we don’t want the audience to be distracted by the technicalities. This is a philosophical personal essay on utopia – many people have pitched in to make it happen, and quite a few of them are here (including Sam’s proud parents).... Sam said afterwards that he’d feared he might get hit by lightning or Tourette’s in the middle of the show. Luckily, he looked so calm that I never would have known. I’m happy to report, that all went brilliantly. The audience laughed and stopped to have long discussions afterwards – maybe this is a jumping off point for each of us to ask ourselves what we are doing (or not) to improve the world we live in. If audiences leave having this kind of discussion, then I think the work is doing it’s job. And as for the producer’s job – a live film can’t be pitched to the normal places. For now, we’re straddling the film and art worlds – booking shows in festivals and museum performance spaces. We filmed this show (Adrian Belic and Bennett Cerf showed up to shoot for us), so maybe we’ll have something we can show to people soon. I suspect that eventually there will be a full DVD of the work. For now, it’s interesting to think about alternative means of distribution... Nobody knows how all our films will be distributed in the near future, but everyone agrees it’s changing. There are panels at Sundance and Slamdance about new distribution methods – and I’ve bumped into various panelists who are fascinated by a project like ours. Anything that breaks the mold is food for thought these days — fingers crossed for all of us!